The Jumping or Chain-fruit Cholla blooms from May through August at elevations from 1000 to 4000 ft. So be sure to look for the bright pink flowers. It’s that time of year when many of our residents have left Tucson and may have temporarily abandoned Sabino Canyon for cooler climes. 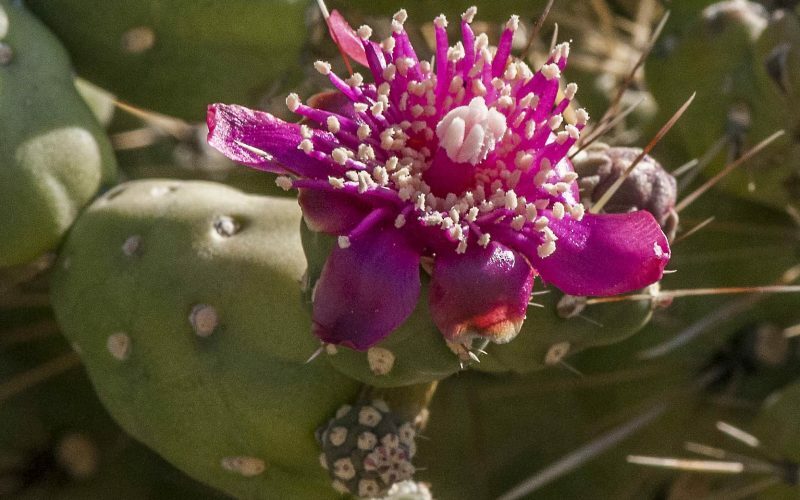 However, this is a good time of year to see many different Cactus blooms. On my walk today (May 19) I came across the beautiful Cotton-candy pink blooms of the Chain-fruit Cholla (Cylindropuntia fulgida). This is also known as a “Jumping Cholla.” We do know that plants can’t really jump. I have clarified that many times with the elementary students. Some of them remain unconvinced. Chain-fruit Cholla has a tree-like structure and is easily recognizable by the large clusters of hanging fruit and cylindrical jointed stems. Stem segments (joints) have numerous spines and large tubercles. There can be anywhere from 2 to twelve spines per areole and the overlapping spines can be from ½ to 1 ¼ inch long. The spines are barbed and have a silver to light golden sheath which can be easily but carefully removed. The fruits are spineless and form segmented clusters from year to year. The fruit may remain undisturbed on the plants for many years as they continue to produce extended chains, sometimes for as long as 20 years. The fruits can contain viable seeds, although they rarely sprout. 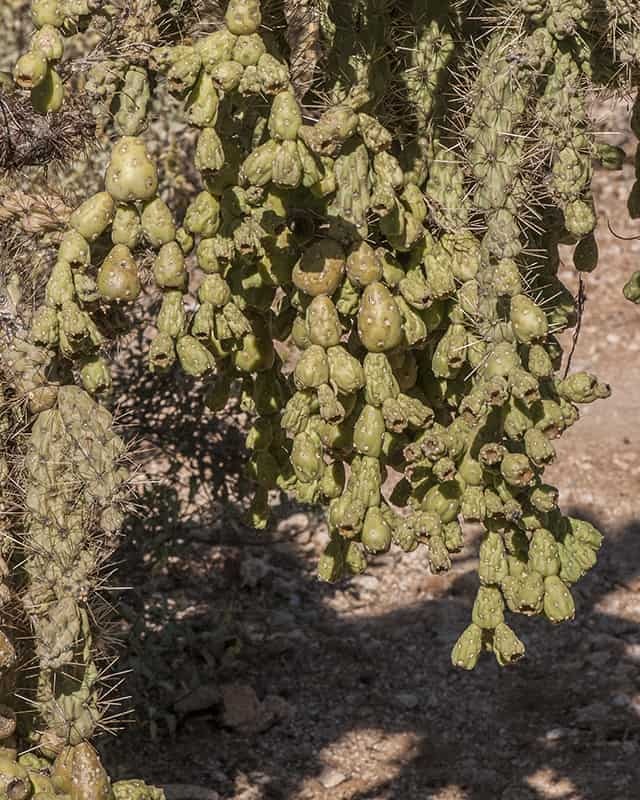 The most common form of propagation for the Chain-fruit Cholla is from the joints, which are easily transported by animals and can sprout new clonal plants. The areoles have dormant buds that can sprout branches. The fruit is edible and has a mucilaginous quality when cooked. During droughts, animals like the bighorn sheep and some deer species rely on the juicy fruit for food and water. The wood has been collected and used for making a large variety of craft items. The fruit, roots and gum of the plant have been used for medicinal purposes such as diuretics and gastritis. Etymology: The name “Cylindropuntia” is from the Greek cylindro (cylinder) and opuntia (refers to an ancient Greek City, Opus). The species epithet “fulgida” is from fulgent or fulgid meaning “bright or shining”. The Jumping or Chain-fruit Cholla blooms from May through August at elevations from 1000 to 4000 ft. So be sure to look for the bright pink flowers. Carry a comb with you to remove any segments that may get caught on shoes, clothing and sometimes (OUCH) skin.